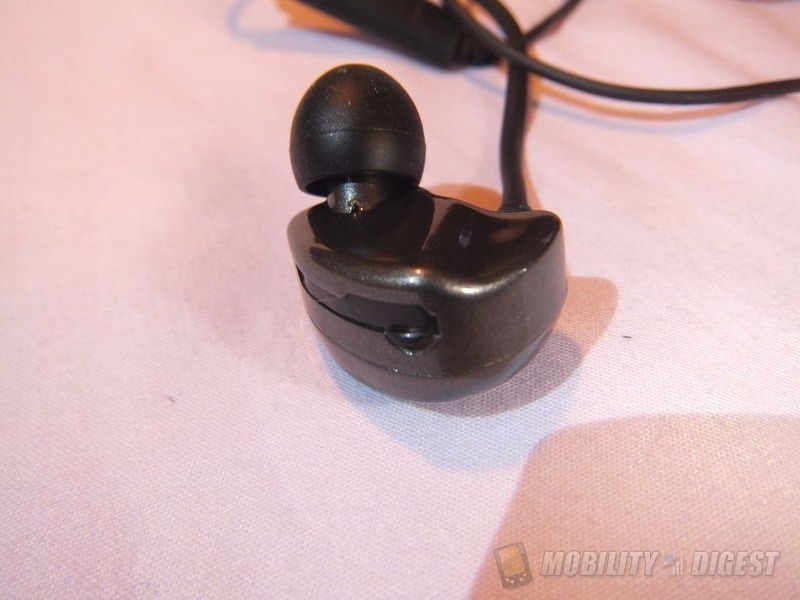 It’s been a while since I’ve reviewed anything over here on Mobility Digest but I’ve got some stuff to review, and we’re starting off with a set of Bluetooth earbuds from a company called FSL or Future Sound Labs. These headphones features dual batteries for twelve hours of play or talk time between charges. These earphones are interesting in that they require a bit of work to wear honestly, the instructions aren’t the best, but once you figure it out they are comfortable and they do sound good. Read on to learn more.. These are the perfect Bluetooth headphones for running, working out in the gym, or just daily activity where you want to be free from those annoying wires. Stylish, comfortable and easy-to-use, simply connect these wireless earbuds to your smart phone, tablet, or other Bluetooth enabled device and enjoy your newfound audio freedom. The FSL Reflex are not only the best Bluetooth sports earphones available, they are simply the best Bluetooth earphones. You don’t want anything flashy, you just want to listen to your music with no distraction. The FSL Reflex Bluetooth earbuds are black and grey and feature a stylish, minimalistic design that is focused on functionality and user comfort. Starting today you’ll never have to deal with tangled headphone wires, getting caught in headphone wires, or accidentally yanking a headphone out of your ear ever again. Connect easily to your iPhone, iPod, Android smart phone or tablet with the Bluetooth wireless functionality and enjoy hassle-free listening. 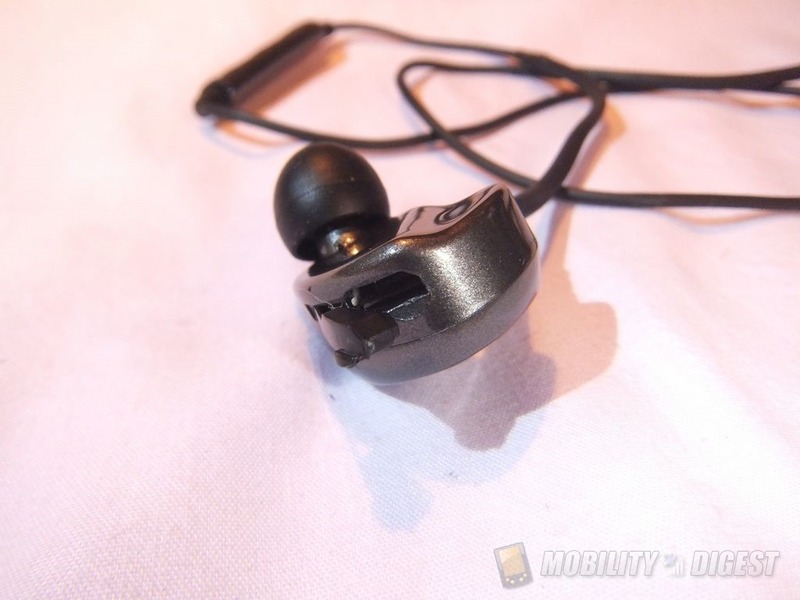 Wondering if these bluetooth earbuds will fit your ears? 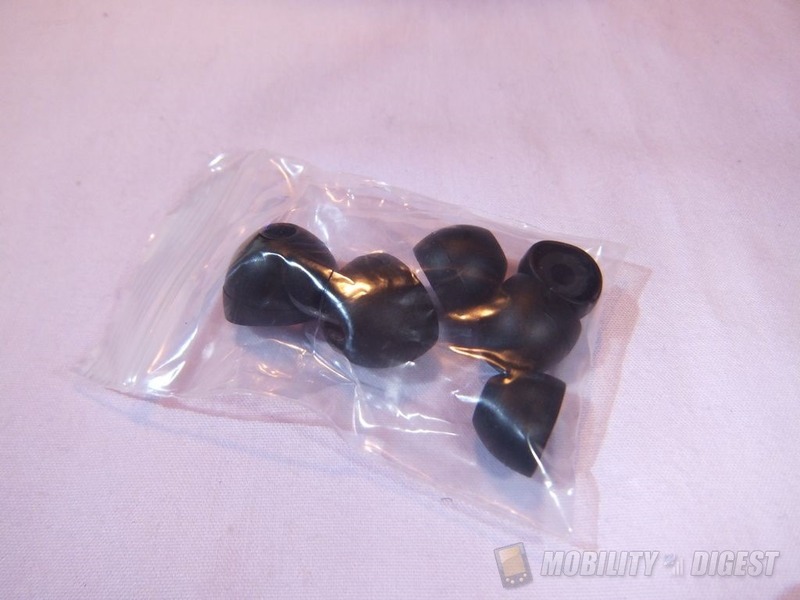 Four different sizes of rubber eartips are included, so whether your ears are large or small you’re sure to find a comfortable fit. And once you’re done listening, zip all the pieces up in the hard case for safe keeping. If you’re used to running in the rain or working up a heavy sweat in the gym, you won’t have to worry about damage to these behind the neck headphones. 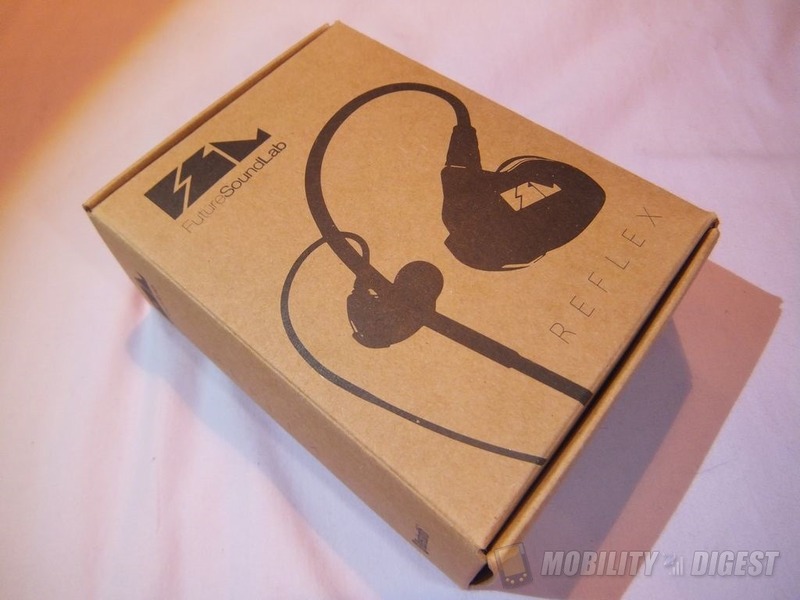 A rating of IPX-3 makes the FSL Reflex earbuds highly resistant to liquids like rain, sweat and water. They are also backed by a 3 year warranty. 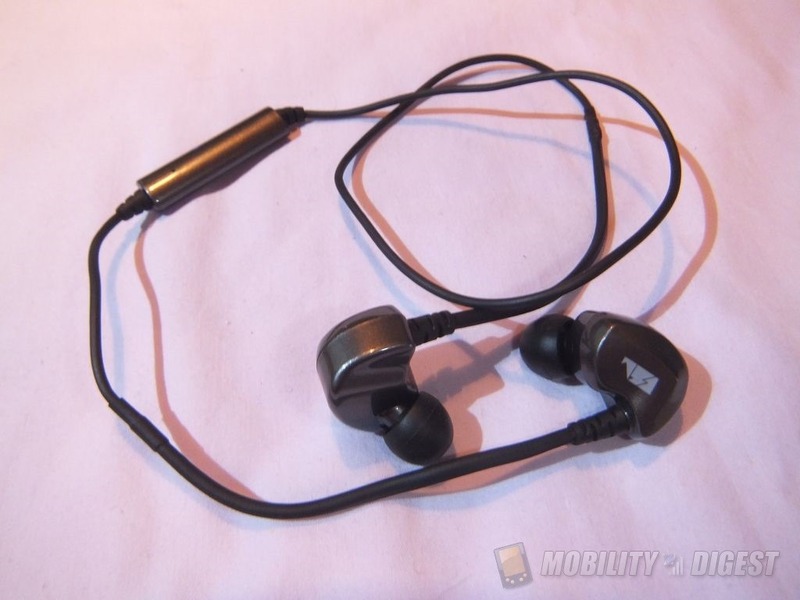 The FSL Reflex Bluetooth Earphones come in a basic brown box and when you open it you’re greeted with a carrying case. 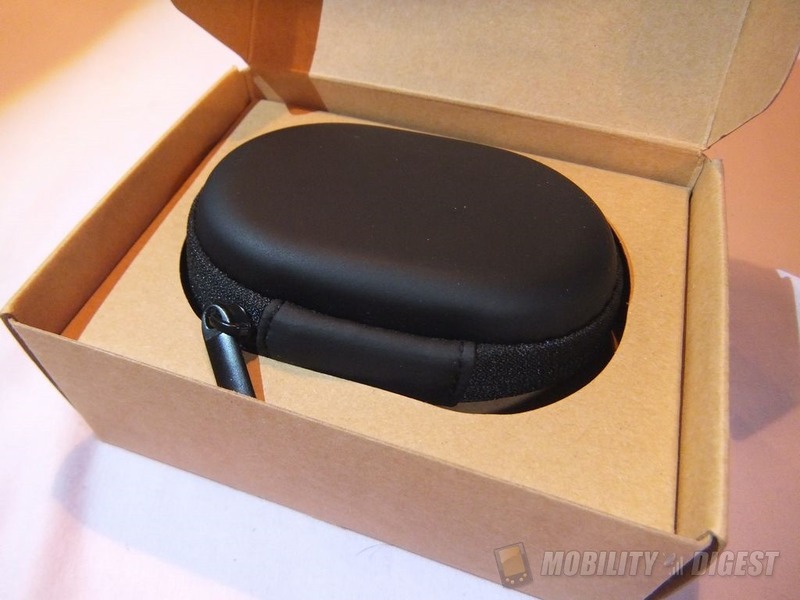 Inside of the box you’ll find a microUSB cable, user guide and zippered carrying case. The case is hard style to protect the earphones and I think it should do a decent job. 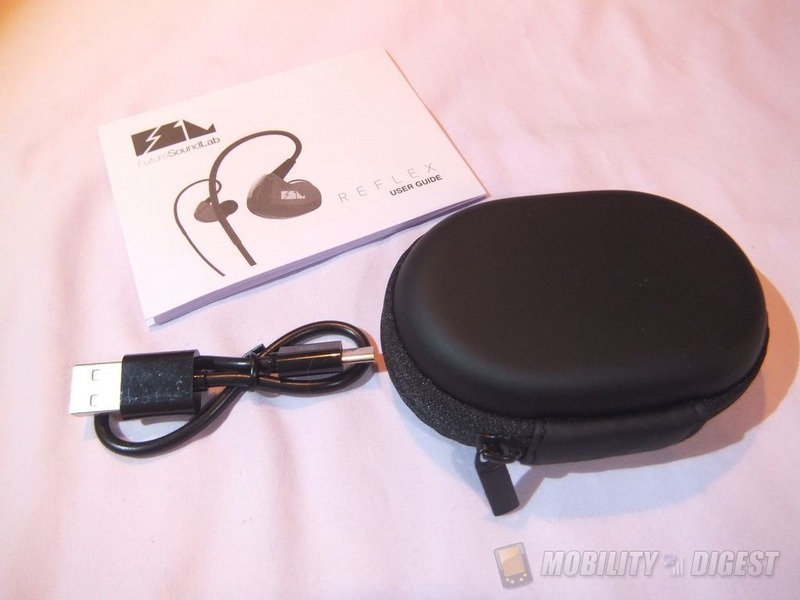 When you open the case you’ll find the earphones and a plastic bag containing extra earbud covers of different sizes. 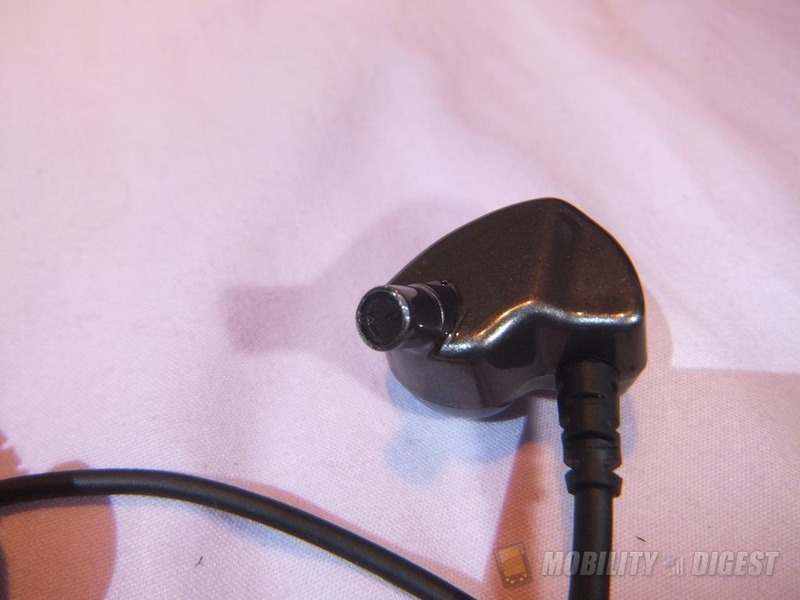 The FSL Reflex headphones are interesting in that part of the wire between them is thick and stiff, about two and half inches from the earphone is thick and bendable to attach them over your ear. The remote is inline and has marking for volume up and down along with play and pause. The play/pause button is also the multi-function button for power, pairing, answer/end calls, redial, switch calls and use voice control, so it does a lot. The volume up is for volume increase and to skip forward tracks, the volume down is to decrease volume and skip track backwards. To use the volume buttons it’s either long press for volume or short press for skip. Above the plus sign is a small LED that can flash blue or red for Bluetooth mode and pairing. 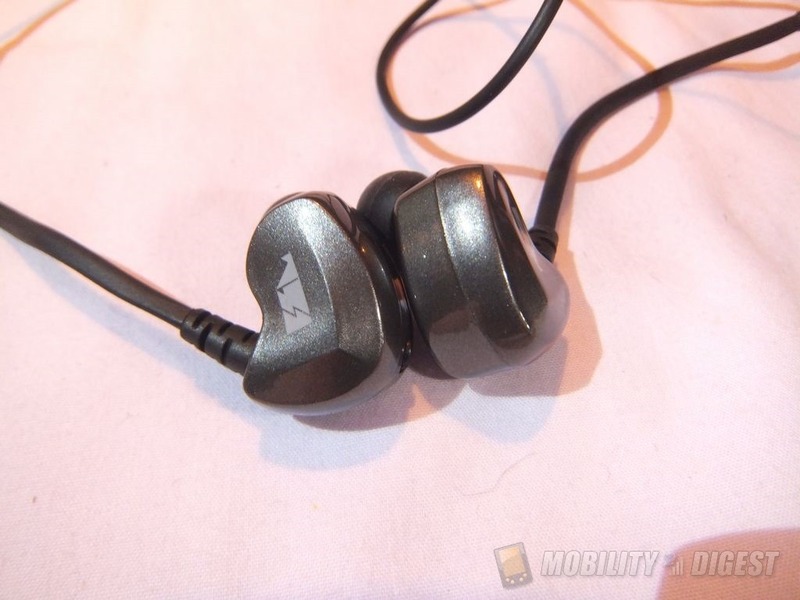 These headphones are unique in that they have batteries in each of them, yes two batteries so they should offer at least 12 hours of run time. 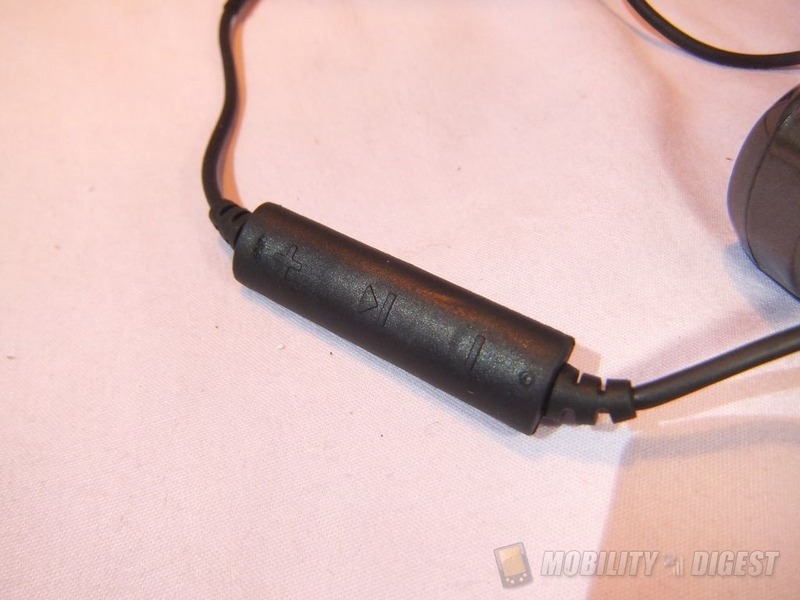 The microUSB port for charging is on the bottom side of the right earpiece, it’s covered with a rubber flap that seals out water and sweat. For testing I used the earphones with my Samsung Galaxy S6 Android phone and they worked just fine. The earphones paired just fine, no issues there. Getting them on was another issue altogether, the instructions really don’t tell you how to wear them or put them on. It took me quite a while to figure it out honestly, but once I got them on correctly they stayed in place comfortably and stayed even with movement so they should be fine for sports related activities or just everyday use. If you don’t wear them correctly they sound bad, once you get them in your ears all the way the sound is much better. 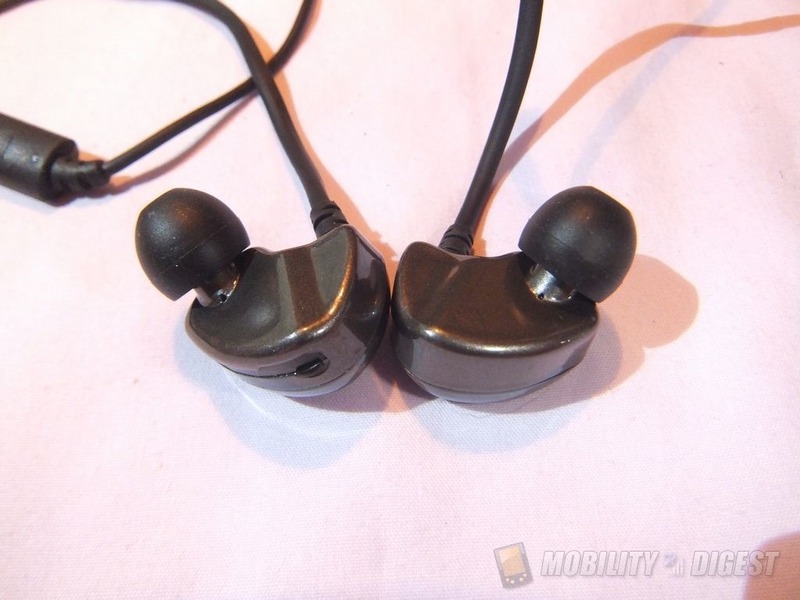 All in all, and if you consider the price, these are a decent set of earbuds. They do offer a nice full sound with bass and treble in there and a nice balance of them. The controls worked just as they should, no complaints there at all. Overall these aren’t a bad set of earphones really, you just need to be carful wearing them, they can be tricky getting them on correctly. If you don’t wear them correctly they don’t sound right honestly, but once you get them on they stay on and are comfortable. The battery life is great, I don’t think I’ve ever seen earphones with dual batteries and 12 hour battery life is just excellent. Sadly the instructions are very lacking especially concerning putting them on. There’s also a labeled diagram of the remote but there are no corresponding number next to the list that goes with the diagram. All in all I like these, for the price they’re not bad, but they shouldn’t be this difficult to wear really. Previous articleFlyin’ Ryan, Tell Me What to Buy! Next articleOpen season on cops, huh?